Why go to all the trouble to create your families own history book? Years ago, my late mother wrote a short history about our family, tracing our roots back to the Cherokee Indians. She wrote about our family as far as possible on my grandfather’s side, which went all the way back to when the Cherokees where living in what is now northern Georgia, but because I was adopted, I don’t know my real father and have never even seen a picture of him, but that won’t stop me from creating a personal ancestral tree and accompanying details for my family. Why should this matter? If we don’t know where we came from, we might not realize where we are today and why? In other words, the more we know about our family’s history, the more the surviving family members can treasure their roots or their heritage. Grandma and grandpa would be very important in relaying details of a family’s history, but so can great grandparents, uncles, aunts, and other members of the family, and perhaps some of the family’s acquaintances. The more you know, the better equipped you will be to write a personal history for your family. You are doing it for your children and grandchildren, but also for their children and grandchildren, and it acts to connect us to our past, even if we didn’t personally know all of our family members. Families are so important to society. As the family goes, so goes society, and with the disintegration of the nuclear family of a father, mother, and children, society has been changed because, in most instances, the father has been left out of the equation. More mothers raise children as single parents than do fathers, so it’s even more important to teach your children about their family heritage, warts and all. When children have both parents in the home, children tend to do better in school, in social settings, and in general, are more productive than children who only have one parent. It’s not a blame game, but it’s just a matter of how God designed the family. When we record the past events of people and places of our relatives, we create in the child’s mind, a connectedness with their past. It gives them a sense of who they are and where they came from, and what I find interesting is that the further you go back into family histories, for the most part, the more you find that those relatives were Christians. We can know we will see them again. We can sense that we are part of the larger family, not born of blood, but those who were born of God and who become the children of God. When this nation was founded, almost 99.8% of the residents were Christian…the remaining being from the Catholic faith. The Bible commands parents to “Train up a child in the way he should go; even when he is old he will not depart from it” (Prov 22:6). It’s not a suggestion but a command, so parents will be held accountable for teaching their children about God. At Mount Horeb, God commanded Israel to “Gather the people to me, that I may let them hear my words, so that they may learn to fear me all the days that they live on the earth, and that they may teach their children so” (Deut 4:10). God taught ancient Israel and expected them to pass this teaching on to their own children. God connects His teaching Israel with their obligation to teach their own children. It would do no good for them to learn but not their children, so God sees as critically important our teaching children about the things of God and the Bible. When God commanded, “You shall teach them diligently to your children, and shall talk of them when you sit in your house, and when you walk by the way, and when you lie down, and when you rise,” (Deut 6:7; 11:19), He commanded parents to teach their children throughout the day and even in the night. When parents, grandparents, and foster parents teach about God, they teach about the things that God has done in the past and why He is to be praised, honored, and His name glorified. Telling your children and grandchildren about what God has done from biblical accounts and your own personal history is essential in instilling in children a sense of awe and wonder of God. It cannot be any clearer that children must be taught about God from a very early age. They should be exposed to the Word of God. In our Sunday school classes for children, while they are doing some of their activities, the Word of God is read to them and then they are asked questions about the verses. It might seem like they’re not listening, but in fact, they are. The Word of God has the power to save (Rom 1:16; 1st Cor 1:18), so it is essential to incorporate the Word of God in teaching children about God. Our family had already started a scrapbook, complete with photo, news articles, and other personal effects of family members. It is chronological, or we started it from as far back as we had with the oldest photos of family members and a few comments about them. As the scrapbook progresses, you can see how styles, fashions, and customs have changed, but the underlying theme may still be the Christian heritage. Today there are even self-publish books or magazines that you can create by uploading images and making them hardback or paperback, or even in a magazine form with a glossy finish. These have been growing rapidly in popularity, just as our hunger to know more about our ancestry. You can even submit some of your own DNA to have it examined to find out where you and your relatives originally came from, although this is fraught with error in many cases. Some are only guesses and can never be absolutely conclusive. Someone once told me they were related to Jesus Christ and they claimed to have checked their own DNA against that of Jesus, but what’s missing in this account? Jesus’ DNA because DNA does not have that long of a “shelf life” and it’s impossible to know what Jesus’ DNA was as we have nothing to find a sample from. That story of being Jesus’ relative is a case where their imagination carried them away. God created families and families should acknowledge this about God. Give God all the glory before your children and grandchildren so they will have a high view of God. A.W. Tozer believes that what we think about God is the most important thing we’ll ever think about, so if you are parent, grandparent, foster parent, or have aspirations to become a parent, remember how important it is to have God at the center of your family. 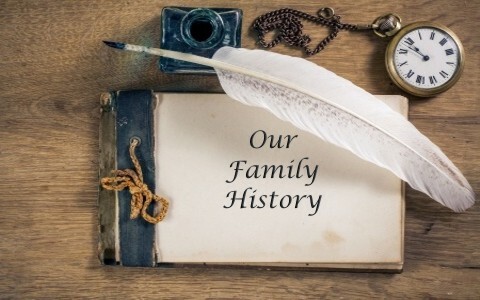 This won’t only be important for your children and grandchildren, but for their children and grandchildren, so why not create your own family history book in whatever shape or form you want it to be. It’ll be worth the effort, and later generations will have you to thank for creating a family history so they can be connected to their past, their present, and connect to those who as yet, are not born. Next post: How Do We Know When God Is Disciplining Us?